With £7,000,000 won every week Tombola bingo is the place to be for mobile bingo. The Tombola bingo app for Android has a brilliant design and is really simple to use. It’s one of our most recommended bingo apps and once you’ve played it you’ll see why! With a £20 sign up bonus when you deposit just £10 we can see no reason not to install the Tombola bingo Android app today! How to register for Tombola bingo – Its simple to register with Tombola bingo, and it will take you under 3 minutes to get started. All you need to do is click the link below from your Android mobile or tablet and sign up. If you are a new customer to Tombola register and deposit just £10 and you will be instantly credited with £20 free giving you £30 to start playing with. In order to Install the Tombola bingo app for Android on your mobile or tablet device, you’ll need to follow the 3 simple steps shown on the diagram below. Before taking these steps, make sure you have registered for your account. To begin the install, click the button provided above once more, then proceed to follow the steps in the diagram. Play Now and Claim £20 Free at Tombola Bingo! 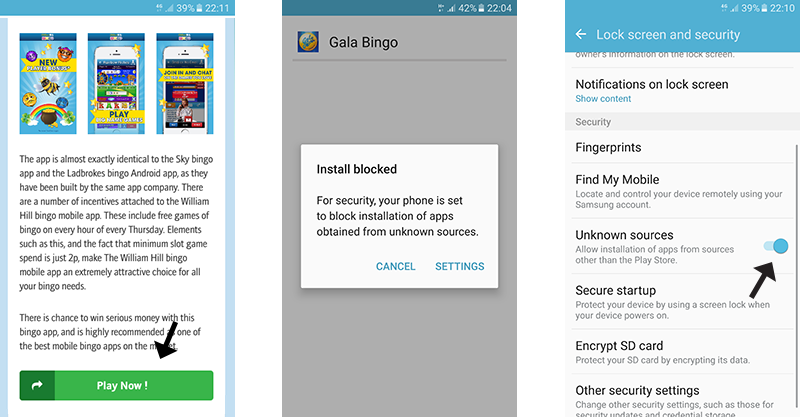 Bingo on your Android mobile just got a whole lot better with the Tombola bingo app for Android. The app is easily the best bingo app available in the UK. The Tombola bingo Android app is managed in house by Tombola which means it is top rated for stability, we are yet to encounter any problems when playing bingo. The new updates to the app are much welcomed to bring it up to the level of the other top bingo apps. The addition of bingo lite and bingo roulette are welcomed to give the app some variety, we would like to see some in play slots or scratch cards to pass the time in the lobby though. Tombola are the biggest bingo company in the UK and their customer services are second to none, we think they are a great company to have your bingo account with. The Tombola bingo Android app also runs fantastically on tablets, which is the way we prefer to play mobile bingo really, and the same steps can be followed to install it on a android tablet as a mobile. The Tombola bingo app has now been updated to include more games than ever including, bingo roulette, Chinco and even more bingo games. Tombola are the only bingo company that keep all their software in house meaning they don’t look like any of the other bingo companies. This is a real plus point of the Tombola bingo app as there’s so many bingo apps that look identical but not this one. As I think you can tell we are really big fans of the Tombola bingo app and Tombola bingo in general! Popular devices for Tombola – The Tombola bingo Android app will run on any Android mobile or tablet regardless of the software. The most popular devices using the app currently are the Samsung Galaxy S4, S5 (we used this one in our testing and it looks great on the big screen) Samsung Galaxy S3, Samsung Galaxy tab 10.1 and the Google Nexus tablet. The Tombola Bingo app for Android has plenty of games for players to enjoy, as well as lots of regular promotions and bonuses. 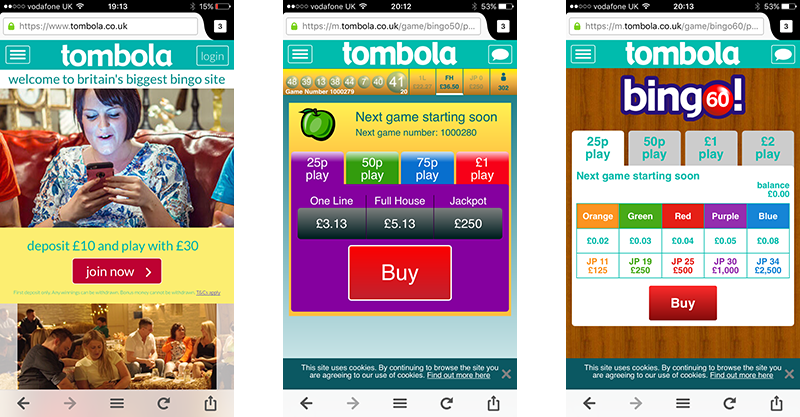 What sets Tombola Bingo apart from other bingo operators is that it produces all of its own content, including its games, in-house. If you’ve played on lots of bingo apps before, once you’ve download this one, you’ll realise just how different and unique it is. While this mobile bingo site offers all the bingo favourite such as 90-ball, 75-ball and 80-ball bingo, there are also a number of games that are completely exclusive to Tombola Bingo, such as Pulse, Cinco and Bingo Roulette. Be sure to download the Tombola Bingo mobile app on your Android/iOS device and claim your 200% welcome bonus today.